Condition is Used. Crossover: second-order electro-acoustic at 2.0kHz. Frequency response: 54Hz–22kHz, ±2dB (on axis), 54Hz–20kHz, ±2dB (30° off axis). Low-frequency extension: 36Hz (DIN). Sensitivity: 90dB room, 87dB anechoic. 5-driver, 3-way surround / rear, reverberant soundfield, wall-mount bracket included. Beautifully Sculpted Cabinets with Real Wood Veneer Finishes. Seven coats of the highest quality lacquer, hand-sanded between coats. They are brick outhouse built. These are listed as s tand mount because they have a port on the back and should not be put on a shelf. Sonically they are perfect. One grill has two plastic nubs broken off, the upper two hold the grill on. Unless you can make a tower speaker (or 2) work as a center, or can fit an over 3 foot wide monster, this is about as good as it gets in the Paradigm line, this speaker isa perfect timbre match for Studio v4 and v5 and even Signature v1. PARADIGM REFERENCE STUDIO/CC V2 SPEAKER. Condition is Used. Low Frequency Extension. 3 driver, 2-way, video shielded, Center Channel. Maximum Input Power. Suitable Amplifier Power Range. Frequency Response On-Axis. For sale a pair of Studio 20 v.4 in black ash. Two-way, reflex-loaded, stand-mounted loudspeaker. Crossover: second-order electro-acoustic at 2.0kHz. Frequency response: 54Hz–22kHz, ±2dB (on axis), 54Hz–20kHz, ±2dB (30° off axis). Pair of New Paradigm Studio 20 v.2. Consecutive serial numbers. Pair 2 Paradigm Studio 20 Reference Speakers Nice!! For sale is a Pair 2 Paradigm Studio 20 reference Speakers In very nice used condition. Low Frequency Extension. Studio 20 v1 Specifications. Sensitivity Room / Anechoic. ±2dB from 54 Hz - 22 kHz. Suitable Amplifier Power Range. This is for a total of 12 bass woofers for Paradigm Signature W5 speakers. The speakers in the photo are for reference only, you will receive a total of 12 of the black bass woofers that are on the outsides of the speakers in the photo. Paradigm Studio CC-470 V3 Center channel. CC470. CC-470 v3 Specifications. This speaker works 100% and sounds beautifully. The detail and image this center puts out makes it harder to part with but it has to go. One of the best sounding speakers I'v had and heard. This is from my personal Paradigm Studio 100 v2 speakers that I upgraded the tweeters on. Were working perfectly fine when I removed it to change to other Paradigm tweeters that I happened to acquire. In great condition, local pickup, may be willing to drive a short distance. Theae look and sound fantastic. These speakers listed for 1200$ each. No wires included sub woofer only. This speaker is pre-owned. This is for 100 V2 41" not for studio 100 V1. PARASDIGM STUDIO 100 V2 SPEAKER COVERS (pair). One of the covers has very small holes. Clean CONDITION. Local pick and inspection is free and CASH only when you do pick up. However, I ran out of characters, and these also have the much improved Signature mids. The tweeter and mid assemblies are from a pair of Signature ADP1 v2 surrounds that I sold the cabinets to a friend with lesser drivers installed. A Pair of Paradigm Studio ADP V2 Surround Speakers. Studio ADP v2 Specifications. Each Speaker has 4 Drivers facing sideways. Room / Anechoic. Maximum Input Power. Frequency Response. in Excellent Condition. We cater to music enthusiasts and audiophiles, and we love what we do. We design audio systems for all budgets, from entry-level to high-end. Two-way, reflex-loaded, dynamic loudspeaker. Crossover: third-order, quasi-Butterworth at 1.5kHz. In beautiful condition, and sound incredible. thing to note, the rubber dust covers have dimples on 2 woofers but it does not affect sound. these are around 25lbs ea. This has been tested and it is in good working order. Unless otherwise stated, this has been tested for key functionality. We are otherwise not open to the public. That would be from Signature v1 and Studio v4/v5. Here is your chance to upgrade your entire Paradigm Signature v1 surround sound, or a Paradigm Studio v4 or v5 system to the best of the best Paradigm Signature v2 beryllium tweeters. Amazing speakers, you will not find a pair in nicer condition. there is one small edge mark as seen in one of the pictures, but these are just like i took them out of the box. these were used sparingly for 2 ch stereo and a couple movies a year. PARADIGM REFERENCE STUDIO SERIES SURROUND SPEAKER. Excellent Condition Studio Series Version 1 Surround Speaker. Minor scuffs and scratches on cabinet. Great buy! 4 driver, 2-way Reverberant Soundfield Surround. Paradigm Reference Studio 40 v2 Center Speaker Only-Black Laminate . Condition is Used. Shipped with USPS Parcel Select Ground (2 to 9 business days). We cater to music enthusiasts and audiophiles, and we love what we do. We design audio systems for all budgets, from entry-level to high-end. We stand by our products. Signature is required. (44.3cm × 40.6cm × 54.6cm). Subwoofer has been tested onsite and is guaranteed fully functional. Subwoofer only, no power cable or accessories included. Photos of actual item for sale. Unit is on hand and ready to ship. Please feel free to message us any question you may have. Thank you for checking out our listing. . These are from v1 Studio Series tower speakers. I will try to add close up photos of these, but rest assured that they are in good condition. Photo is of my personal Studio 100 v2. You are bidding on ONE PARADIGM STUDIO 100 V3 CROSSOVER SECTION. This is a used complete crossover section from a 100v3 that might have some minor surface marks but is otherwise in great condition and works perfectly. It comes with both low and mid/high frequency section and all wires. This is your chance to save big-time so don't miss out!!. You are bidding on ONE PARADIGM STUDIO 100 / 60 V3 MIDRANGE DRIVER. This is a used driver from a Studio 100 v.3 speaker that might have some minor surface marks but is otherwise in great condition and works perfectly. This is your chance to save big-time so don't miss out!!. Genuine Paradigm Studio 60 / 100V.3 Midrange Driver. Local pick and inspection is free and CASH only when you do pick up. PLESE SEE PHOTOS FOR ALL THE DETAILS. They can also replace the black bass woofers as these are higher end materials and play as low as the black bass woofers in the 2.5 way designs, the black ones are just used by Paradigm to save money as they don't need to be as nice since the black woofers only handle bass frequencies. These are getting very hard to find as the Studio Monitor series goes into highly collectable status. BUT HERE’S THE DEAL. Yes, they really said that! So, what we’ll do is SHARE the risk that you nor I are one of those abusers. Used gold feet set. Fit the Monitor 90P V1 and some Studio 100 V2 I own and i'm sure several others but nothing iv'e owned. Larger than the BP theading which is unique to them as far as i know. Have another set of feet and spikes to list later. They are the smaller spikes that fit all my MK3, Monitor V1 and V2 and all my Studio V1. I've had 4 pair of 100 V2 over the years. Only one pair used this size. 3 other pairs used the smaller more common size so check your speakers before buying. Paradigm Studio 20 v2 crossover and backplate Only 1, also fits many other Reference. Condition is Used in working condition. Tested. Sold as is No returns accepted Check all pictures. Paradigm Studio 100 / 100 V2 / 80 60 gold metal feet 8pcs . Used condition, scratches present. For L/R tower speakers. Metal feet 8pcs , spike screw 5 pcs. You are bidding on ONE PARADIGM STUDIO 100 V3 SPEAKER FEET. These are 4 used feet from a 100v3 that might have some minor surface marks but are otherwise in great condition with no cracks. This is your chance to save big-time so don't miss out!!. There are 4 pictured, but 8 are included, all in very good used condition. These are a nice upgrade for Paradigm Monitor 7, 9, 11 v3 and v4 (and I believe v5 and v6) Studio 470, 570, 60 and 100 v3. Original PARADIGM STUDIO 100/100 V2/80/60 feet and spike. If item is used, it has been used previously. Local pick and inspection is free and CASH only when you do pick up. Paradigm Gold Feet Set. Fits Se-Mk3, Studio V1-V2, Monitor V1-V2 Tower models. Used gold feet set. Fit the vast majority of Paradigm tower models from the late 80's into the late 90's. A few large models used heavier bolts with feet designed for them but only a small handful used the heavy duty feet. I have a set of them for sale as well. You can use the spikes alone or with the feet or thread the spike end into the speaker and just use the feet without the spikes. Depends on your floors and personal preference. Any questions please ask before buying. Look at the pics close. You are getting exactly whats pictured. Original PARADIGM STUDIO 100/100 V2/80/60 feet and spike. Local pick and inspection is free and CASH only when you do pick up. If item is used, it has been used previously. 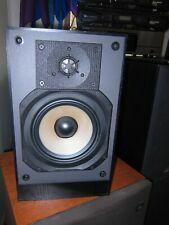 Used Paradigm Studio CC V2 Center Speaker. CC V2 Center Specifications. Suitable Amplifier Power Range. One corner of the plate is prepared (glued). PLESE SEE PHOTOS FOR MORE DETAIL. 90 dB / 87 dB. Sensitivity Room / Anechoic. 2 Prong Cord / Cable for Paradigm Reference Servo 15a / Studio Sub 12 powered subwoofers. Very good condition Paradigm Studio 100 V3. No home entertainment system is complete without a set of quality speakers. Paradigm Studio speakers have a distinct look and crystal sound quality, which is what makes them be the icing on the cake for any stereo system. Check out the following questions about Paradigm speakers sold on eBay for all the information you need before purchasing your own set. What features do the Paradigm Studio speakers have? Crossover: Each speaker has a high-quality crossover to ensure that each frequency range is sent to the right speakers. That guarantees a clean signal. Input power: Each tower can hold 170 Watts of input power, meaning it has a high headroom before the signal distorts or breaks up. High-frequency driver: The highs in the frequency spectrum are what gives music its crystal clear sound. These speakers have a dedicated driver for that range. Sturdy: Each tower is wood paneled and weighs 50lbs. These speakers are designed to be in a home for years. 2-1/2-way floor standing: The speakers broadcast in 2.5-way direction, meaning they cover more area with less volume than omnidirectional speaker cabinets. What finishes are available for these speakers? The Paradigm Studio speakers aren't only functional as these tower speakers are large enough to be considered pieces of furniture that are central to the aesthetic of any home. Because of this, Paradigm makes them in a variety of finishes to suit the taste of any shopper. The three available options for most models are cherry, rosenut, and black. There are also smaller speakers designed for shelves or stands in the product line. What models of the Paradigm Studio speakers are available? There are multiple models of the Paradigm Studio speakers on eBay, each having their set of features. The following are the models you can shop through on the site. 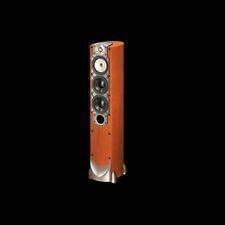 Paradigm Studio 100: The tower version of the speaker with every feature the company offers. Paradigm Studio 60: Mid-sized tower speakers with three speakers instead of four. Paradigm Studio 40: The larger of the company's bookshelf speakers. Paradigm Studio 20: Smaller more compact speakers meant to blend in any room while providing stereo sound quality.